I grew up eating slices of cake right out of the middle of the 9-by-13 pan. Chocolate butter cream, burnt-sugar peanut butter frosting, or fat pieces of vanilla — when you’re the second youngest in a family of six kids, you take the best piece when you can get it. I’ll admit that I still do this today, and at any number of family gatherings we all groan and complain when we see that middle piece missing. Really, everyone is angry that THEY didn’t get the best piece. Sorry, too slow. The rolling hills of Holmes County, Ohio — my hometown is Berlin — afforded me a well-fed childhood. We had plump hens, floured and fried, and cooked until the bones nearly fell off. Along with that there were mounds of mashed potatoes with brown butter, and noodles — oh the noodles! — that glistened and slid down into my belly. I could live on noodles, but won’t, because it’s called slowly-being-carbed-to-death. You can’t help what you’re fed as a child, and I was no different. The only thing I would send back is the fried liver Mom tried to feed us, along with the slimy green balls (no, they weren’t Brussel sprouts) that I still to this day can’t place. I simply remember being made to sit at the table until I had eaten them. Shiver. We never suffered when it came to food — and holidays were the best. Weeks before Christmas, Mom, my sisters, and I would make caramels, buckeyes, and stained glass candy. I can smell the kitchen as the mysterious ingredients would bubble and broil like cauldrons of goodness. I would help roll the caramels into small pieces of wax paper and quickly twist the ends, sealing them up, only to have them opened later by sneaky hands. And the tiny bottles of oils printed with the names of wintergreen and peppermint were like secret potions that smelled of wonder. 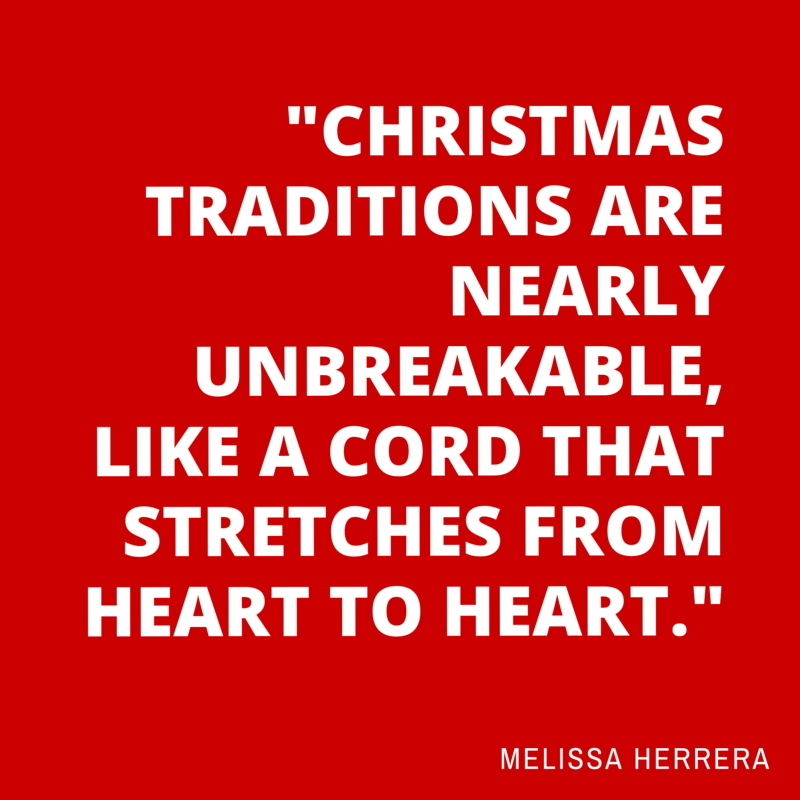 Christmas traditions are nearly unbreakable, like a cord that stretches from heart to heart. 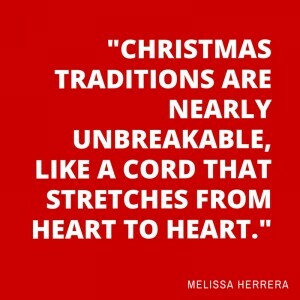 Ours was always held on Christmas Eve, with all of us gathering in Mom and Dad’s kitchen. The menu was the same: appetizers. Shrimp, pink and plump with Dad’s homemade sauce (always heavy on the horseradish), crab dip with buttery crackers, and an array of whatever recipes had caught our eye and we saved during the year. Festive platters groaning with cookies and chocolate-dipped shapes appeared, and there was so much goodness to sample. It has been fun, through the years, to see what we bring to the table. Some dishes are staples, but there are always new and luscious things that appear. I blame Pinterest. When my parents moved outside of town, from that black-shuttered house that was my only home growing up, we started having Christmas at one of my sister’s houses. Fuzzy drinks and sangria appeared in heavy-cut bowls, along with several new traditions tucked in here and there as the years passed by. We have never been in want during the holiday season, and for that I am grateful. I thought about several recipes I wanted to share. My mind raced through dishes we share at Christmas time, or something vibrant and delicious I’ve tried while visiting my husband’s family in Mexico. My kitchen is normally filled with spicy goodness, having learned the many techniques of our neighbors to the south. Enchiladas, pozole, and quesadillas of every flavor — those are my go-to recipes in the day to day of my life. I believe, though, that the recipe I want to share is cake. After all, isn’t that where we started? This recipe was adapted by my mom from the Betty Crocker cookbook — the one from the ’50s. She added the chocolate sauce — a very old recipe — which must be served hot over the warm cake. It also must be eaten quickly and with rapture on one’s face — because that’s how I eat it — right from the middle. For cake: Preheat oven to 350 degrees. Mix sugar and butter. Blend in baking powder, salt, two-thirds of milk, vanilla, and egg. Stir in flour and the rest of the milk. Bake in a greased and floured baking pan for 35-40 minutes. For chocolate sauce: Melt butter and chocolate squares in a large saucepan over medium to low heat. Add milk. Heat on low until almost boiling. Mix sugar and flour in a separate bowl and add just enough water to make it pourable (about ½ cup). Pour sugar mixture into milk mixture, stirring constantly. Cook over low heat until thickened. Add vanilla extract and salt. Cut cake while still warm and serve with sauce poured over the top. Melissa Herrera lives in Berlin, Ohio, with her husband Antonio. 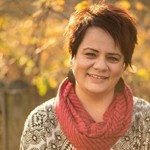 Her three kids have flown the coop to jobs and college, which leaves plenty of quiet to work on her in-progress novel. She writes freelance, handles social media for businesses, and is a book hoarder. You’ll most likely find her seeking out local shops, small restaurants, and the forgotten architecture in the small towns of Ohio.